DESPITE TEN POEMS FOR DIFFICULT TIMES being an exquisite collection of contemporaneous poetry chosen by British author, speaker and writing guide, Roger Housden (born 1st August 1945), it is actually his complementary essays that bring this beautiful pocketbook to an even deeper and more meaningful expression. The seventh volume in the best-selling Ten Poems series, undoubtedly, this decad of verse stands unflinchingly on its own merit, with poetical classics, as well as lesser-known works, by W.S. Merwin, Wendell Berry, Ellen Bass, Conrad Aiken, Maggie Smith and more. And yet, for me at least, it is Roger’s elegant and understated composition that yields a profound insight into the nuance of syntax, structure and subtext without which my appreciation of literary versification would be utterly diminshed. 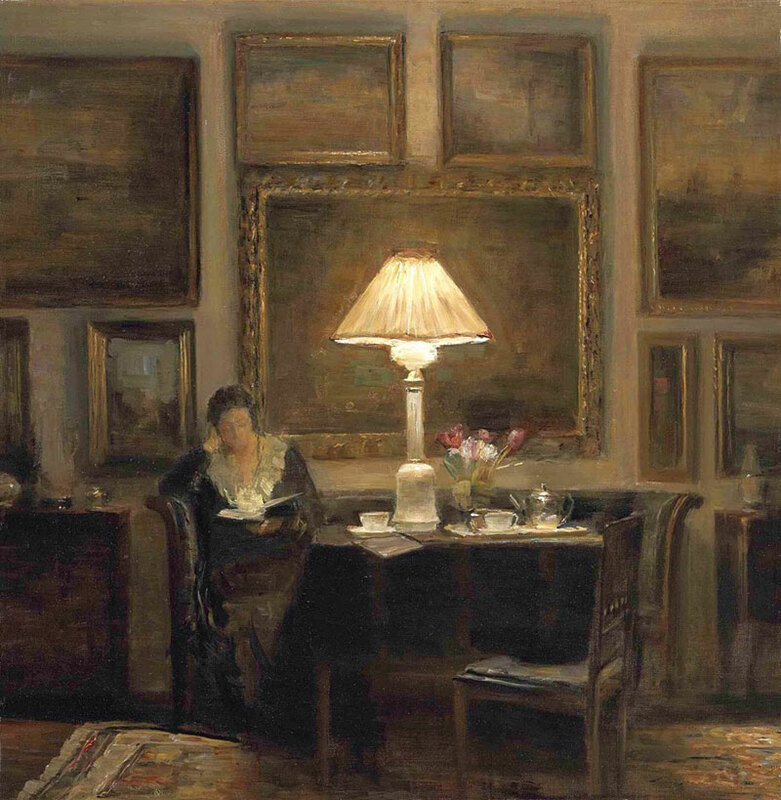 Carl Vilhelm Holsøe, Interior With the Artist’s Wife. Since time immemorial, human beings have understood the healing properties of sound and the way in which it transmutes the very soul. From the incantations of tribal shaman, through the chants and mantras of Hinduism and Buddhism, to the Gregorian plainsong of early Christianity, aural vibrations have aligned the individual spirit with the omnipresent Divine. The spoken—rather than sung—word is of no exception. A distilled sentiment or sensation encapsulated in the most concise of stanzas, poetry is an immediate portal to the transcendental state, evoking visceral responses from the sublime through to the most ordinary of life’s daily events. 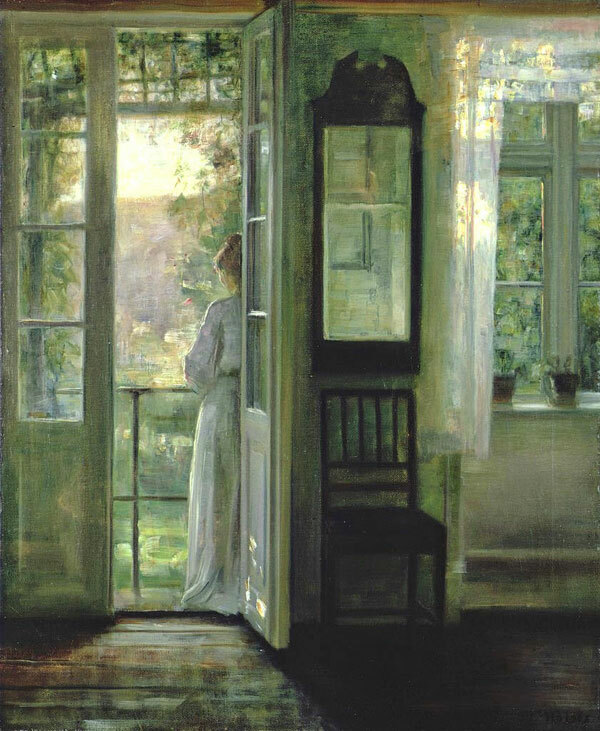 Carl Vilhelm Holsøe, Girl Standing on a Balcony. Arguably, there have always been and always will be diffcult times in the unfoldment of human destiny; and yet we apper to live in an unprecedented time frame whereby suffering and conflict are perpetually promoted through online media platforms into which we are permanently plugged. Paradoxically, creative endeavour always flourishes during such periods of darkness and corruption, not least the art of poesy, be it presented through an anthology of verse or a live recital performance or even rap. 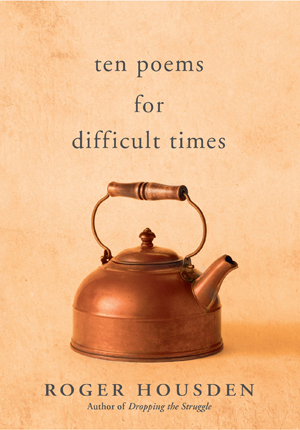 Ten Poems for Difficult Times, as the title suggests, delves deep into the most exquisite pain of the human heart, acknowledging the “Sorrow Everywhere” (Jack Gilbert, “A Brief for the Defense”) and that “The world is at least / fifty percent terrible, and that’s a conservarive / estimate” (Maggie Smith, “Good Bones”). And yet, it also counterpoints the way in which the soul of man is able to rejuvenate itself in the midst of grief and agony, “Sometimes from sorrow, for no reason, / you sing” (William Stafford, “Cutting Loose”). Moreover, akin to a redemptive and restorative act, “… we rose, to the angelc voices of the music, / And I touched your hand, and we kissed, without a word” (Conrad Aiken, “The Quarrel”). Indeed, even in the depths of utter despair, Turkish poet, Nazim Hikmet, who spent eighteen years as a political prisoner, is still able to capture eternity in a moment: “I stand in the advancing light, / my hands hungry, the world beautiful. / My eyes can’t get enough of the trees— / they’re so hopeful, so green. / A sunny road runs through the mulberries, / I’m at the window of the prison infirmary” (“It’s This Way”). 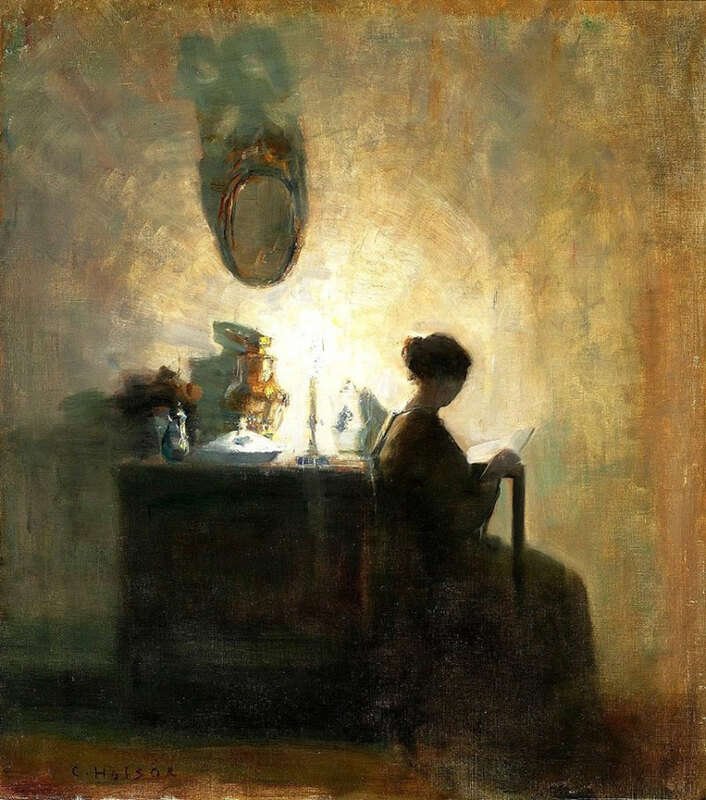 Carl Vilhelm Holsøe, A Lady Reading by Lamplight. Roger’s critique of each poem renders greater depth and appreciation for the sophisticated interplay of conceit and cadence infused between every single word. Furthermore, he freely reveals his own personal and poignant responses to the way in which his poetical anthology has triggered unconscious emotions to be revealed. Candidly, he explains how despite being engaged in seemingly meaningful employment for nonprofits, writing socially responsible articles for The Guardian, even sitting with holy men in India and the West, he felt there was a huge hole deep in the centre of his life. I nodded in knowing agreement. 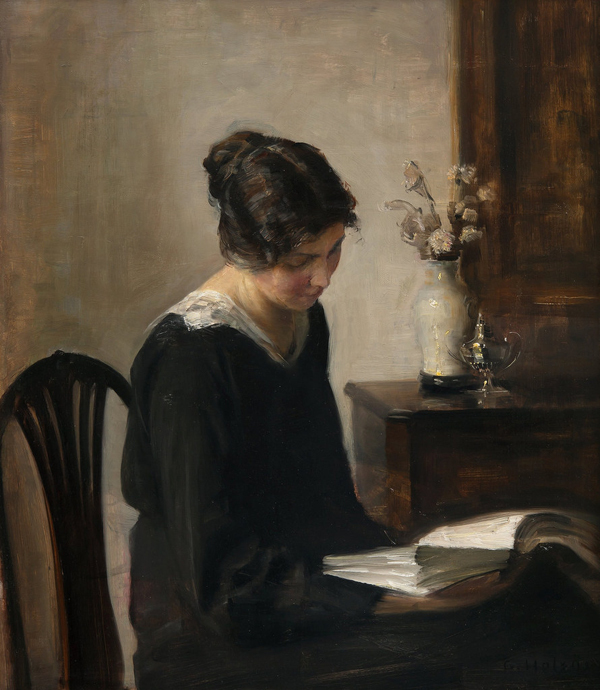 Even more unexpectedly, he also writes of the taboo of having a pregnant wife and then falling deeply in love with another married woman and the subsequent pain of not being able to enact their feelings for one another. How my heart yearned in utter sympathy for their futile love. 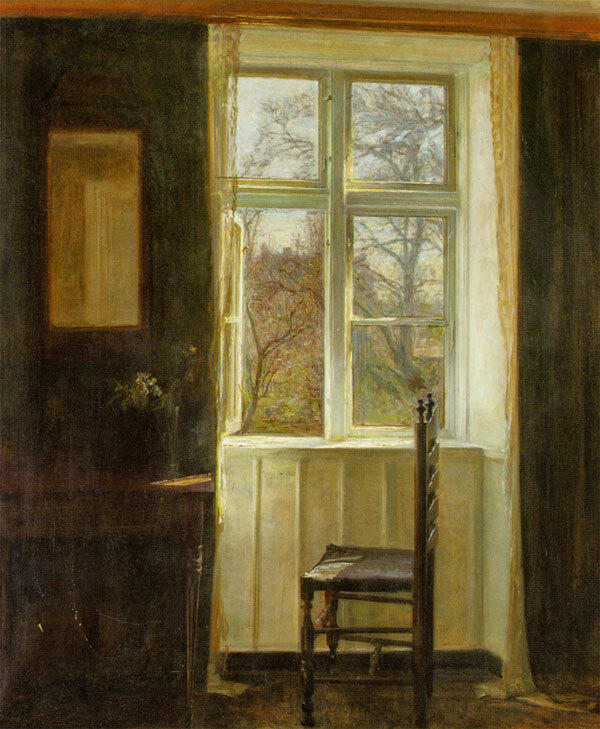 Carl Vilhelm Holsøe, Open Window. Roger’s effortless, flowing prose, banked by passing references to other great poets of the past—T. S. Eliot, John Keats, Alfred Lord Tennyson, William Wordswoth, Samuel Taylor Coleridge, W.B. Yeats—renders a deeply regenerative read in a world of soundbites, hashtags and ironic memes, reiterating Sir Philip Sydney’s creed in his Apology for Poetry that poesy begins in delight and ends in wisdom. Moreover, a poem per se offers us a means of salvaging our weary souls and steering them to yonder shore, a place where the luminescence of all the universe shines down upon us so that “… we open / and open more / and open still / to the blessed light / that comes” (Jan Richardson, “How the Light Comes”). Roger again: “Poetry can give a human face to our collective struggles and remind us that this human world is not only broken , it is beautiful … There’s a headstone in a Long Island graveyard—the one where Jackson Pollock is buried—that I think encapsulates the value and necessity of poetry in a world of sorrows: ‘Artists and poets are the raw nerve ends of humanity. By themeslves they can do little to save humanity. Without them there would be little worth saving. '” Amen.